Teeth Whitening is actually a mild bleaching process that restores stained or discolored teeth to a healthy, natural color. Don’t be misled by unproven and ineffective over-the-counter whitening solutions. Our office uses an advanced procedure that is only available from your dentist as we choose the best products as rated by independent agencies. 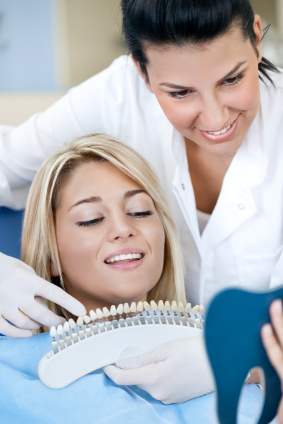 Your dentist will evaluate your teeth and smile to determine whether whitening is right for you. In some cases a different cosmetic procedure may better meet your expectations, but whitening is a safe, fast and easy process that is effective for almost everyone! Next, we will fit your custom trays in your mouth to ensure they feel comfortable. Then you apply the whitening agent to your trays and insert them into your mouth. Each treatment takes approximately one hour, but the process is quite comfortable. Most patients see results after the first treatment. It will typically take a few treatments to restore your teeth to a lighter color. The time it will take depends on the original color of your teeth, how discolored they were, and how frequently the treatment is applied. The effects typically last a few years. Many patients choose to “touch-up” their teeth every 6 to 12 months after their regular cleaning. “Touch-ups” are especially useful for patients that drink beverages that stain teeth, like coffee, tea, and colas. Some patients may experience heightened tooth sensitivity to cold, or mild tooth or gum sensitivity during treatment, but these symptoms are only temporary and disappear within a day or two.